In my previous post about James Turrell at the Guggenheim and Robert Irwin’s re-installation of Scrim Veil-Black Rectangle-Natural Light, 1977 at the Whitney (June 27-Sept 1, 2013), I suggested that Irwin might have taken Marcel Breuer’s trapezoidal window as his starting point, given that the window’s narrow black frame appeared to share both color and dimension with his long horizontal bar and the painted black stripe that runs, also horizontally, around the walls. When I wrote to the museum for exact measurements, however, I was told “the curators are unaware of any correlation between the dim [frame] on the window and the width of the black stripe.” Knowing the precise observation inherent in Irwin's work, I decided to put the question to the artist himself. In doing so I gained insight into what Irwin was thinking when he first entered the Whitney gallery 35 years ago, and how the philosophy that drove that piece is still at play in his work today. The following is from a phone conversation on September 3, 2013. CD: I wrote in my post that the window, whose black frame roughly matches the elements you added, appeared to be your starting point. Is that so? RI: No. 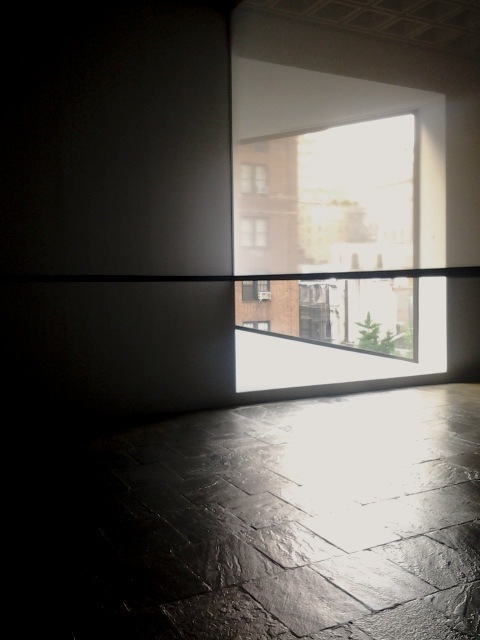 The first thing that struck me when I entered the room at the Whitney, was the black floor. Then there’s the ceiling, not handsome, but a factor, and the quality of the light from the window, the way it disintegrates over the length of the space. And, of course, the sheer size of the room – an empty room of that scale is something you don’t generally encounter in New York. The window is the architect’s revenge; the angles are a perfect perspective to the buildings across the street, and it has a pictorial element, which make’s it almost impossible to show a painting there. Most of the time they have to hide the window. The window is a detail, but not a principal one. Normally when you walk into the room you take a check—the first responsibility of perception is to keep from being killed—so you check coordinates, rapidly. But I did something at the Whitney that doesn’t stand out, which was paint the wall opposite the window a shade that’s considerably brighter than the other walls—if you were to turn a light on in the room at night, you’d see that it was about 65% gray. So when you come in, you know that something’s not quite right, but only subliminally. The situation was an opportunity to make a statement about the idea of “conditional” —as well as how, and in what way, the conditional acts in world. What do you mean by “conditional”? Instead of being in the studio and conceiving things, the artist isolated in the frame, the idea is that the perceiver can deal with the world itself and make all kinds of value judgments, engage the cognitive self to make decisions in the world. I was intrigued by the idea that rather than creating a metaphor, an artist can function directly in the world…. …and eliminate the “frame,” which includes wall text, labels—all the paraphernalia that designates a thing as “art” and separates it from life. It’s about using the same elements in the museum and the outside world, making something, but not really making anything, just pointing it out. If we take the history of modern art as a question, does “making” equal “art”? Is it necessary to make something or can it be about operating in the world as it is? I just took it one step farther. The one thing that distinguishes each of my students from the other is an individual sensibility; my job as a teacher is to help them find that key element, and develop it. So I come to a situation and add to that existing dialogue from what’s at the core of my being an artist. I’m not a landscape designer, but made a garden at the Getty. The same with the design of the Dia:Beacon. I am not an architect. 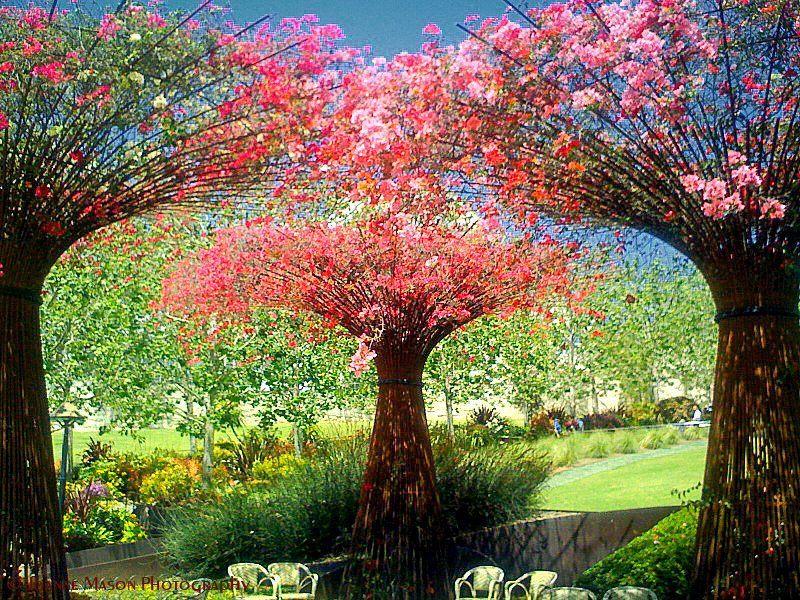 Getty Garden. iPhone photograph. f/2.8. Copyright (c) Joanne Mason 2011. I recently had a conversation with an artist, and when I told him you designed the Dia:Beacon, he said, “But there’s nothing there. He didn’t really do anything to it.” He meant that your signature wasn’t on it. I thought you’d like that. When I consider a space, I don’t have to bring to it other kinds of abstract rationale. The Dia doesn’t act as a piece of art. When architects design museums, they are creating major pieces of sculpture. In the beginning, they have pure intentions, but when it becomes big business, they start to act as if they’re artists. It’s unethical to build a building that doesn’t function. So getting back to the Whitney, it can’t be coincidence that the frame around the window matches the bar and painted stripe. No, of course not. The window is definitely an element in the vocabulary. And there are only a few others in that space: the floor, the disintegration of light over the space, the ceiling. Of those the disintegration of the light was probably the most appealing aspect for me. The light is a subject that goes through this amazing exercise before your eyes, which the scrim then multiplies...sometimes opaque, sometimes transparent. It’s interesting that your show coincided with Turrell’s at the Guggenheim – both involving space, light, iconic architecture…. But it’s not fair to compare Turrell’s current work with something I did 35 years ago—35 years is a long time in a life. And when I did it, it was like I threw a rock in a pond and there were no ripples. Now it’s a cause célèbre; it just took that amount of time to get back to me. The same with a column I made in 1971, that's just now found a home in the San Diego Federal Courthouse. I can understand why, though. At the exhibition I saw at Chicago’s MCA in 1975, you did two pieces: the scrim wedge and one that was simply—to my mind at the time—a black bar running around the floor. I was hugely affected by the scrim piece, but it was too early in my life as an artist for me to understand the other. Now I would get it in a flash. Maybe people are just catching up. 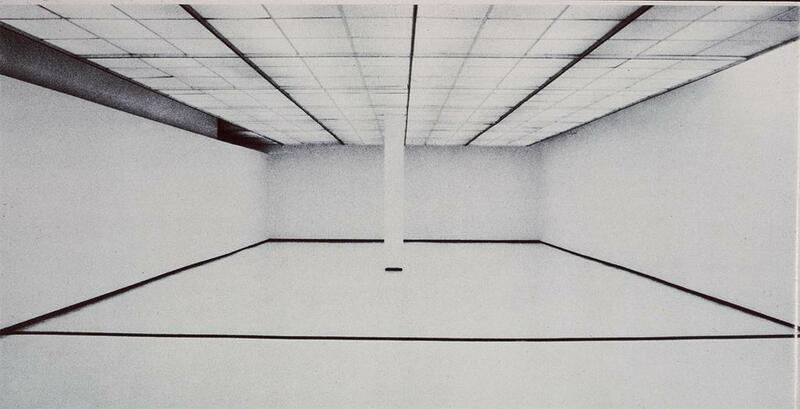 Robert Irwin, Museum of Contemporary Art, Chicago, 1975. 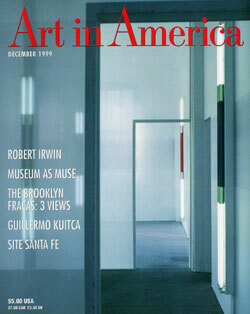 Further reading: Carol Diehl, "Robert Irwin: Doors of Perception," Art in America, December, 1999.